What Kind of Jobs Do History Majors Land? What happens to history majors who don't become historians? A new tool offered by LinkedIn, the social media website for professionals, provides a clue. Press a button and you can discover where people who studied history went to work, what they do, and where they went to school. The results are drawn from LinkedIn's vast pool of users (165 million, by some counts). LinkedIn says the results upend stereotypes. In a post about the survey tool LinkedIn noted that Fine Arts majors have found opportunities in scores of professions including technology. What about people with a background in history? Here's the scorecard. It shows that 1,101,426 of LinkedIn members studied history. LinkedIn doesn't indicate if its algorithm gives equal weight to people who majored in history in college and those who studied history in graduate school, so the results are somewhat ambiguous. The website's pool of members may also not be representative. Many people who majored in history do not belong to LinkedIn, which is generally used by professionals and business people. 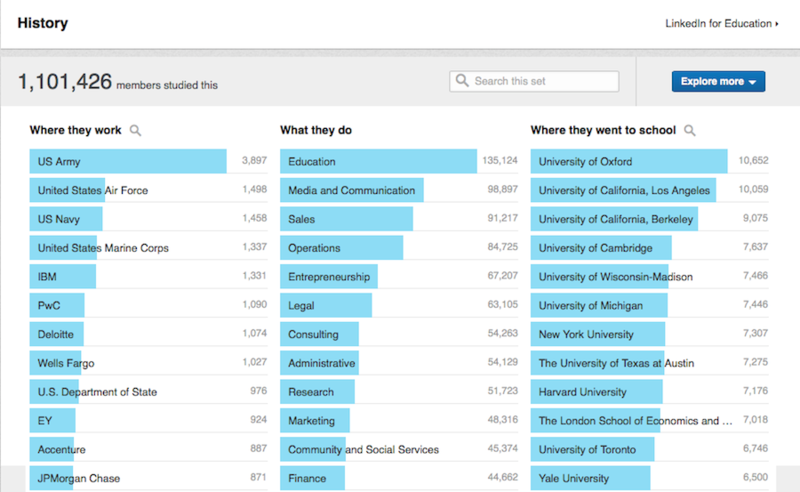 An indication of the unrepresentativeness of the pool is that the school with the highest number of LinkedIn history graduates is Oxford. Also surprising is the number of people with a background in history who ended up in technology. Who knew that IBM employs more than a thousand history lovers? Or that Google employs more than 600?